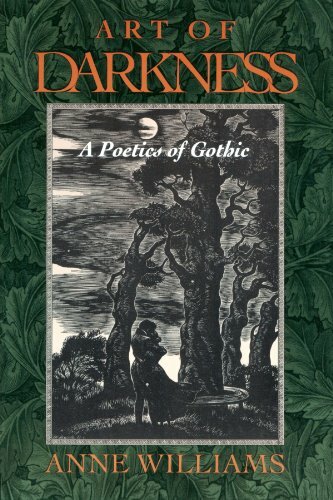 Art of Darkness is an ambitious attempt to describe the principles governing Gothic literature. Ranging across five centuries of fiction, drama, and verse—including tales as diverse as Horace Walpole's The Castle of Otranto, Shelley's Frankenstein, Coleridge's The Rime of the Ancient Mariner, and Freud's The Mysteries of Enlightenment—Anne Williams proposes three new premises: that Gothic is "poetic," not novelistic, in nature; that there are two parallel Gothic traditions, Male and Female; and that the Gothic and the Romantic represent a single literary tradition. Building on the psychoanalytic and feminist theory of Julia Kristeva, Williams argues that Gothic conventions such as the haunted castle and the family curse signify the fall of the patriarchal family; Gothic is therefore "poetic" in Kristeva's sense because it reveals those "others" most often identified with the female. Williams identifies distinct Male and Female Gothic traditions: In the Male plot, the protagonist faces a cruel, violent, and supernatural world, without hope of salvation. The Female plot, by contrast, asserts the power of the mind to comprehend a world which, though mysterious, is ultimately sensible. By showing how Coleridge and Keats used both Male and Female Gothic, Williams challenges accepted notions about gender and authorship among the Romantics. Lucidly and gracefully written, Art of Darkness alters our understanding of the Gothic tradition, of Romanticism, and of the relations between gender and genre in literary history.